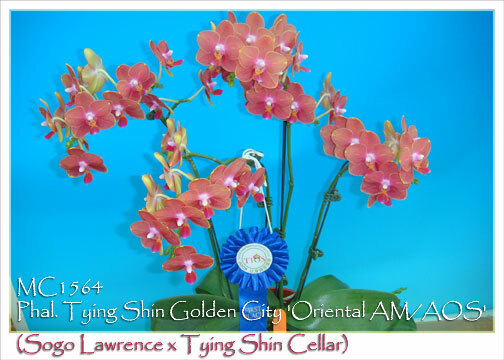 Our first release of a spectacular new hybrid from the famous Tying Shin Orchid Nursery in Taiwan. Granted its Award of Merit at the Taiwan International Orchid Show in 2008, it carried 56 flowers and buds on four branched inflorescences. Its golden yellow flowers are heavily overlaid with rose, as is the lip, leaving just a peek of yellow flaring on the petal tips. 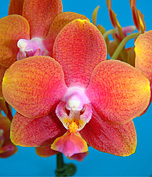 Its 2 ¼” flowers have heavy substance creating a long-lasting vibrant display. Very Highly Recommended. ! Oriental AM/AOS , note :Light Fragrance !